Audie Award Finalist, Audio Drama, 2016 In 1914, the war which was to have been wrapped up by Christmas had - in reality - only just begun, as all sides entrenched themselves deeper into the Great War. Christmas Eve, 1914 follows one company of British officers as they rotate forward to spend their Christmas on the front lines, a mere 80 yards from the German guns. Upper- and working-class men and boys are thrown together into one trench and struggle to survive. Beyond the exploding shells and artillery, the merciless freezing cold, extreme hunger, and crushing exhaustion, these young men - both British and German - discover a miracle of grace, as enemies becomes friends and an impossible Christmas finally arrives. 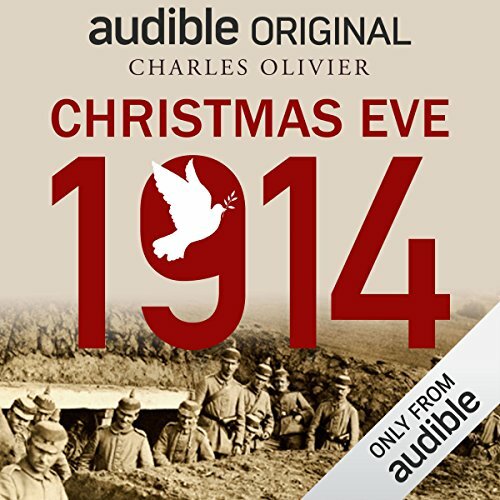 Written by Emmy Award winner Charles Olivier and produced by Dawn Prestwich (The Killing) to commemorate the Christmas Truce's centennial anniversary, this astonishing moment of peace in the midst of total war is brought to life as a vivid and immersive audiodrama, featuring a full-cast performance, elaborate sound design, and an original musical score. Listeners will also enjoy a classic Christmas carol, "Il Est Ne", performed by Tom Tom Club, at the conclusion of the story. The full cast includes Damon Herriman, Cameron Daddo, Xander Berkeley, James Scott, Lance Guest, Nate Jones, Cody Fern, John Beck, Gabe Greenspan, and Heiko Obermoeller.